P. armeniacum (L.) DC, Syst.. 2: 120 (1821). Syn: Argemone armeniaca L., Sp. Pl., 509 (1753); P. roopianum (Bordz.) Sosn. in Mon. Jard. Bot. Tiflis, 27: 3 (1913). Figures, p. 223. Biennial, not glaucous. Stems 20-40 cm, numerous from the crown, hispid with rigid setae below. ± glabrous above. Lower leaves (2-)3-4 x pinnatisect, the segments linear, 1-3 mm broad. Buds ovate, up to 1 cm. Petals orange-red, 0.75-1.5 mm. Capsule 8-12 mm, narrowly elliptic to oblong, ribbed, strongly torulose. Fl. 7-8. Limestone screes, eroded slopes, etc., 2600-3400 m.
Kurdistan. B9 Van: d. Başkale, Ispiriz Da., 2600 m, D. 23623! C9 Hakkari: Kara Da., 2700 m, D. 24365! ?Transcaucasia, N.W. Iran. Ir.-Tur. element. Two specimens, D. 23841 (Hakkari, Zab gorge, 3( m S of Başkale) and D. 24138 (Hakkari, Cilo Da., 10 km W of Cilo Tepe), ombine the characters of P. armeniacum & P. fugax. This species was much confused by Fedde (op. cit. 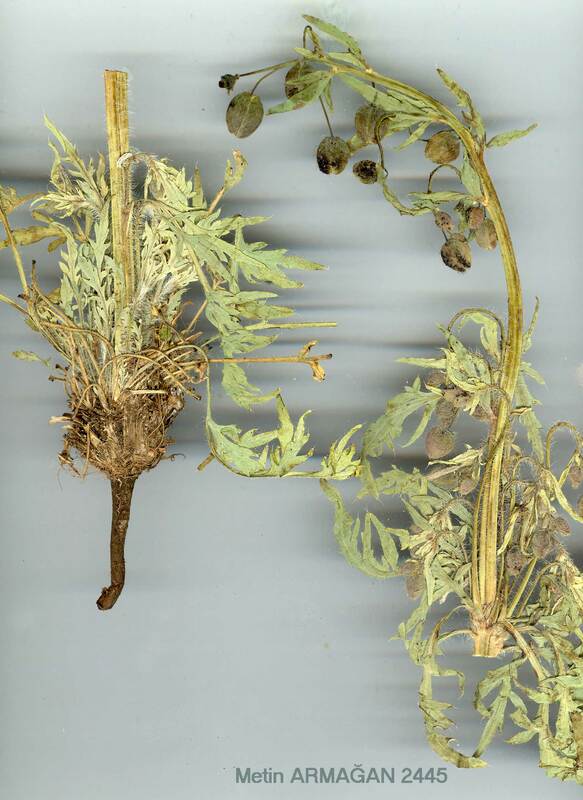 ), who included in it specimens referable to P. triniifolium (cf. Cullen, 1963, in Notes R.B.G. Edinb., 25: 43), and its exact distribution is unknown.